My whole family has weight issues. The rest of my family learned to deal with it. I always had some cushion, but since I landed in a wheelchair several years back, it’s been a chore. Can’t get too much aerobic exercise. So, I have to be extra vigilant with my diet. I had two apps that I faithfully used for a year but I wanted something that was a self-contained system that would sink up all of my devices. After trying several systems, I came across MyFitnessPal. Well, I know all that. But does it make for a simple, yet thorough, solution? To utilize all of your tools, you sign up for a free subscription. This enables you to keep everything in sync. So, when I’m not at home, I can utilize any iDevice to keep track of my days intake. You can utilize the web site to manage things such as your BMI, BMR, or how much blood your heart has pumped each day. And of course, you keep track of you calories, carbs, cholesterol, et al., via their servers. You can track your daily consumption of salt, sugar, and various vitamins. It will calculate not just what you intake but alo how much more you need of each to rech your daily totals. burned, and more. 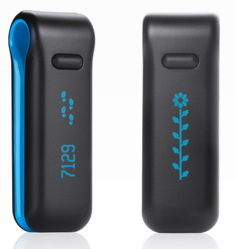 Connect your Fitbit Ultra to your MyFitnessPal account to automatically adjust your daily calorie goal and import the data measured by your tracker.” I know someone that has a Fitbit Ultra and she swears by it. But fear not … if you’re not interested in all the physical stats, you can still use the apps on their own with the benefits of the database for free. I haven’t had the opportunity to use a Fitbit Ultra unit, but I have used the iApps and an online account for several weeks. The apps have performed flawlessly and extremely fast. 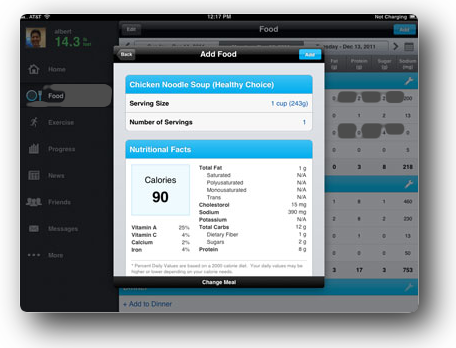 The apps access MyFitnessPal’s extensive database of foods and beverages. You can also keep track of your water intake and your exercise regimen. Because they have you covered on every device, no matter where I ate I was able to immediately input my information, knowing that it was being synced to my account. Never once was I not able to access the servers, something that I had experienced with similar iApps. I found that the UI of the iPad app to be as perfect as it could be. But that’s due to the amount of rel estate. The same can be said accessing MyFitnessPal via your computer. Although the iPhone app is very intuitive, the lack of real estate forces the manufacturer to pack a lot of utility into very small space. Honestly, I’d love to see it as perfect as the iPad’ UI, but I’ll be darned if I know how they could do it. MyFitnessPal is always with me wherever I go. And you can have your stats tweeted, thereby having many people hold your feet to the fire without having to pay for a personal trainer. This is a thoroughly thought out and very impressively executed piece of software. All developers should do such excellent work. This entry was posted on Monday, February 27th, 2012 at 3:50 am	and tagged with health, Mac software and posted in Reviews. You can follow any responses to this entry through the RSS 2.0 feed.